ART LOVERS: Intermittent showers kept Honolulu damp for much of the day, but "ARTafterDARK" went off without problems Friday evening at the Honolulu Academy of Arts. The crowd was smaller for "Vintage Hawai'i," featuring the "Hawaiian Idyll: The Prints of John Kelly" exhibit, than for August's "Havana Heat" party, but that was all to the good because it didn't take nearly as long to get something to eat or drink. Lena Lei Ching, left, Dana Finnegan, Miriam Rabin and Melissa Pinch talked story while the Hiram Olsen Trio played Hawaiian and hapa-haole classics in the central courtyard. CATCH HER IN THE NEXT ISSUE: Mary Moriarty, right, visiting from Kauai, checked out the party with Molly Watanabe of SMART Magazine. Moriarty, whose interests include hunting, fishing and target shooting as well as shopping, will be seen in an upcoming issue of SMART when the magazine explores the Garden Island. 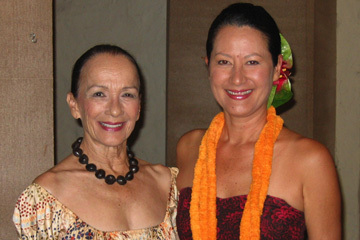 LEGENDS OF HULA: Bev Noa, left, talked with Kanoe Miller early in the evening. Having Miller dance hula with the Hiram Olsen Trio added to the vintage ambience of the event. Lucky folks who happened to be hanging around the central courtyard at the right time got an expected bonus when Olsen invited Noa up to dance "Lovely Hula Hands." The song wasn't written for Noa, but her performance personified the romantic lyric images. MEET AVA: Proud mom Kristine Altwies was escorted by Peter Rockford Espiritu, left, and Dr. John Magauran, as she introduced her daughter, Ava, to "ARTafterDARK" and the Honolulu social scene. Local theater veterans remember Altwies' superb portrayal of a dog in Manoa Valley Theatre's production of "Sylvia" in 1998. 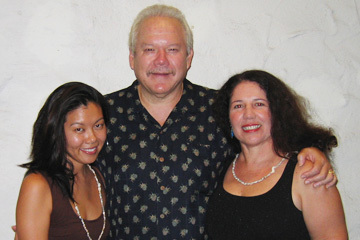 SHARE HIS DREAMS FRIDAY: Kapono Beamer and his wife, Dayna, right, talked with Sarah Honda of SMART Magazine. Kapono will play music from his excellent album "Slack Key Dreams of the Ponomoe" on Hawaiian 105 KINE's "Aloha Friday Luncheon" this week. WHAT'S NEXT FOR ANNIE? 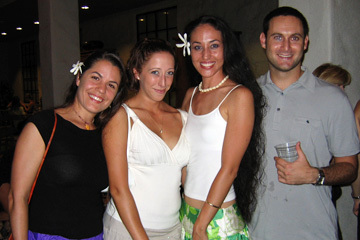 : Malia Ribeiro, left, Ashley Larson, Annie Lokomaika'i Lipscomb and Jake Wormser chilled on the back patio. Lipscomb gave an excellent performance as a woman falsely accused of witchcraft in "Vinegar Tom" at the UH-Manoa Ernst Lab Theatre last month. She'll be back on stage in "Battle of Will" at UH in November.